Samantha Angell: Travel & Lifestyle Blog: 1 Week in Des Moines // Napa Next! It has officially been a full week since Nick and I moved down to Iowa! At just about this time exactly last week, we announced that we were moving on from hockey, and moving to Des Moines. Since then, we have both been busy bees getting settled into life down here- and new jobs! 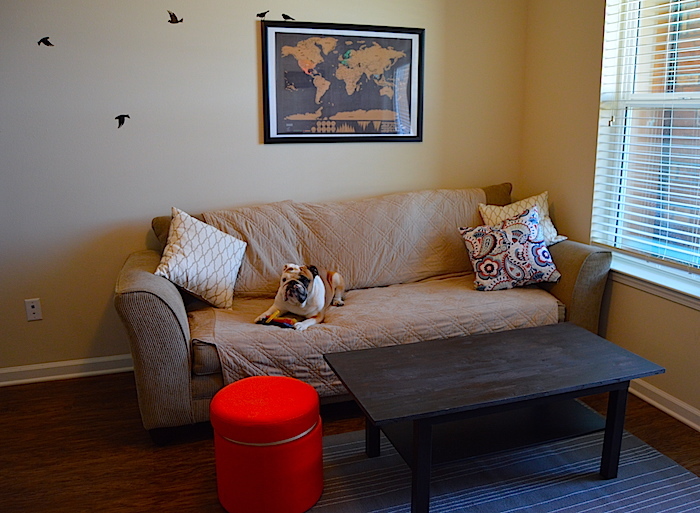 Upon arriving, we moved all of our stuff in, assembled our Ikea furniture, and started making the place feel like home. My Mom drove down from Minneapolis to help us move in (and bring a trunkful of our things!). As such, Friday and Saturday were pretty busy days getting organized and settled. When Saturday night came, it was time for a break...so we decided to check out the local scene, and headed to have a couple of drinks at 515 Brewery! 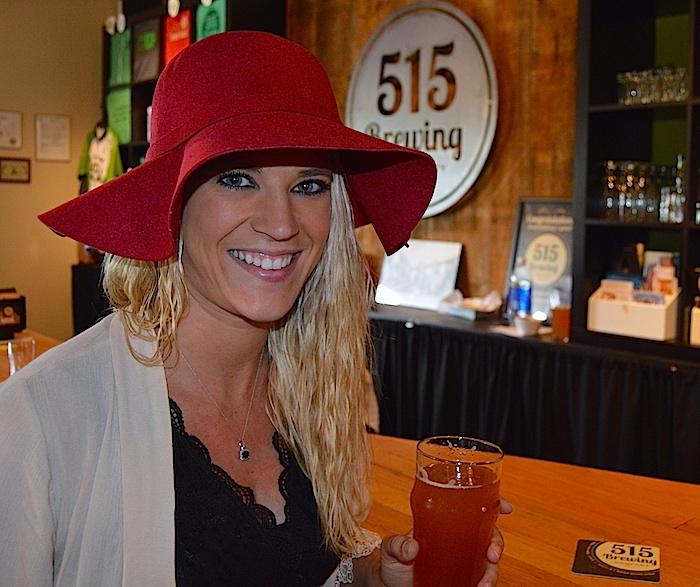 515 Brewing is a local brewery about ten minutes from us, located in West Des Moines. Full review on them coming later! Since the move, I've been DIY-ing like crazy. So far, I've created a unique coffee table for us- just a slight modification to an Ikea table. In addition to that, I've been working on making some awesome drink coasters with pictures of our travels. DIY can really help to make an apartment feel like your own, so Nick has put up with me driving all over town getting supplies and getting set up here in Des Moines. My favorite DIY that I've completed so far is our coasters- they have pictures of our travels throughout the world (including several pictures of Västerås! ), so they are a very unique piece to us. Lily, our bulldog, has taken a couple of days to get settled. She wasn't too sure about the move at first- especially when we had no furniture- but is finally starting to enjoy the place. Right now, she is curled up next to me on the couch snoring away. 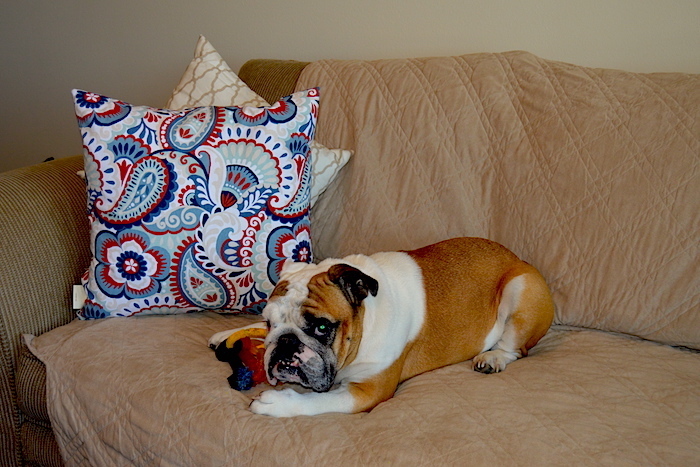 Also, you might notice our throw pillows- we saw the funky pillow, and knew that we had to have it as a touch of Sweden! Our place is starting to come together nicely! We purchased a couch last Saturday, and then spent some time running around town and picking up throw pillows and our bright footrest. Really serves for a pop of color in the place! One of my next DIY projects is possibly to recover it to a less stand-out-ish blue (to match our Scandinavian pillow). The first thing I hung up on the walls is our scratch-off travel map. While the frame isn't 100% complete- we still need to mat the picture- we love the uniqueness it adds to our living room. Jobs...Nick has started his training, and is just working on the products. Think of it almost like hockey, where the guys have to learn the plays and things like that before getting out and practicing. I got hired for a couple of restaurant jobs right away, but have ultimately decided to go a different route...I'll be working as a Leasing Professional! Our apartment complex was hiring, and I went in a whim to apply and ended up getting hired. I start work on Monday, and am super excited for the career change and to get going. The new position sounds awesome, and perfect for me with my marketing and sales background! With the career change, Nick and I have to head up to Minneapolis this weekend to pick up all of my more business professional clothes. The other piece of exciting news around here...Nick and I will be headed to Napa Valley in July! I've never been to Napa before (or California at all) so this will be my first trip, and I am so excited! We are staying at a great airbnb location near Oak Knoll. 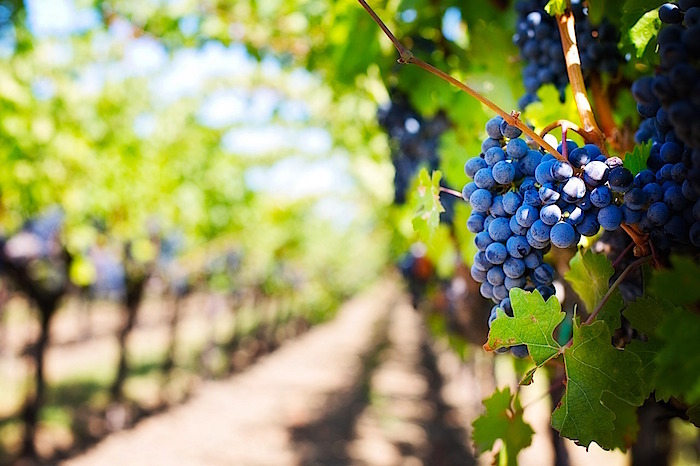 For anyone who has been to Napa, shoot me your best recommendations- I'd love to hear them! So that is life in Des Moines over the past week! What do you have planned for the weekend? Any fun trips coming up? Congrats on your move and new jobs! How exciting! Thanks Amanda! Definitely an exciting- and busy- time for us! Have fun in Napa! I would love to go there one day, so I can't wait to hear your take on it. I'll definitely be posting about it, thats for sure! It will be my first time and I've been dying to go- so I can't wait! Thanks Lois! I'll definitely have to check out Chandon and see if it is close to where we will be staying for a tour! Well congratulations to you two :) Keep having fun as you settle in your new city! Love the map and the pillows, they are great touches! Have fun in Napa too! Thanks Ana! This week has been crazy busy with getting settled in to work- hopefully this weekend I'll be able to explore more! It looks like you are settling into Iowa nicely! I love the coffee table you made! After living in our new house for a few weeks we finally bought a couch last eek and still dont have much furniture yet.You guys are killin it! I'm excited to hear about the brewery and Napa sounds amazing! I've never been but am dying to go!